I’m so thankful that I was able to watch surgeries during my last clinical affiliation. I spent 6 weeks treating patients with various medical conditions, including those recovering from joint replacement surgeries. I learned so much by being in the OR, and was able to gain a much better understanding of what patients experience before they are evaluated by physical therapy. I’ve included links to some Youtube videos of actual surgeries, so if you don’t want to see anything gruesome, I would recommend skipping the live surgery videos! Eat breakfast. I ate twice as much food as I normally do in the morning, just to make sure that I didn’t feel hungry during surgery. I was able to step out of the OR and grab a snack if I needed to, but you won’t want to miss a minute of surgery! Ask if you can bring a notebook. I took a few notes during the surgery of anything I wanted to read about later, or anything that was really interesting so I could share with my classmates. I was so engaged with watching that I forgot to write down some things, but I’m glad that I was able to take some notes. Use the restroom before you enter the OR. Yeah, yeah, I totally sound like a parent before taking their kids on a long car ride. It’s good advice though, even if you don’t feel like you need to go. You won’t want to miss any of the surgery, so do your best to go beforehand! Ask if it’s okay for you to ask questions. I was too nervous to ask anything to the surgeon, but I did ask some questions to the PA and others in the room. If I am able to watch a surgery again, I’m definitely going to ask if it’s okay for me to talk more. Try to move a bit when you’re standing. Do your best to not lock your knees. You may be able to move around a little bit to get a better view of what the surgeon is doing. Make sure you know what to do if you aren’t feeling well. Don’t be afraid to speak up, even if you are a little embarassed. Everyone in the OR should be caring and understanding, and just want to make sure that you don’t pass out on the floor. Make sure you know what is sterile. You should know this before you even go into the room. Look out for anything sterile right when you walk in (someone pointed everything out for me), and be careful to not reach over sterile tools! I almost did that because someone was handing me something, but don’t get complacent after you’ve been in there for a few hours. If you treat any of the patients that you see, don’t tell them that you watched their surgery. This might go without saying, but just be cautious. One patient asked me a couple questions about what happened during surgery, and I had to make sure that I didn’t share that I was there. Ask your CI and the PA for any tips. My CI is the one who told me to eat plenty of breakfast beforehand, and I’m glad that I followed her advice. Asking others for advice is especially helpful if they’ve been in the OR with the same surgeon, or if they’ve seen the same surgery before. Before I was able to schedule which surgeries I wanted to see, I took an hour long class where I watched a video and took a quiz. I learned about sterile techniques, how to move around the OR, and several ways to prevent infections. The morning of the surgeries, I went to the same office where I took the quiz. I picked up my name badge for the day, changed into scrubs specifically for the OR, and put all my belongings into an assigned locker. Then I put on shoe covers, a hair net, and a face mask. 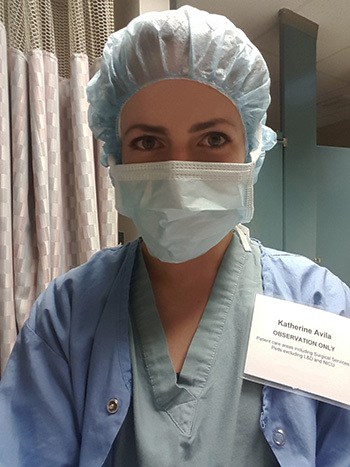 I didn’t have to wear gloves or scrub into surgery because I wasn’t considered a “sterile” person in the room. Therefore, I wasn’t allowed to get too close to any sterile trays, instruments, or the patient. I was able to enter the OR just before the patient was wheeled into the room. The surgery team was setting everything up, and I made sure to stand near the edge of the room to stay out of the way as much as possible. Everyone was really friendly and made me feel comfortable. It was difficult to not be able to touch anything, because I was curious about all the tools and I wanted to feel them for myself. This was the first surgery that I was able to observe. The surgeon did an anterior hip replacement, which means that the incision is done between the tensor fascia latae, sartorius, and quadriceps muscles. The surgeon is able to push the muscles aside instead of cutting them, which is different from a posterior hip replacement. It was interesting to see how different the skin and muscles looked compared to what we’ve seen in the cadaver lab. There are so many different tools used for the surgery, and there were a few that I was able to recognize. We practiced pulsatile lavage on plastic models during our wound care class this fall, so it was cool to see it utilized in surgery. I also wore a radiation vest when the xray machine was in the room. It was so interesting to see the new joint on the xray right after it was placed. Here’s a video of an anterior hip replacement. There are a lot of videos on Youtube, so please watch other ones too! I couldn’t find one that explained well and had a good video, so watch more if you’re interested in learning. I was able to see a bit more of this surgery because the knee is flexed and raised off the table almost the entire time. The surgeon used a GPS system to map out the location of the femur and tibia to ensure that the new joint was appropriately aligned. This wasn’t used for the hip replacement I saw, so it was really interesting to watch the screens. The metal parts of the new knee were held in place by bone cement. I was able to put on some gloves and squeeze some extra bone cement in my hands. It felt like clay at the beginning, but after a few minutes, the cement became impossible to mold and became too hot to hold in my hands. One of the most interesting things I saw during surgery was that the surgeon injected anesthesia into the periosteum and the skin around the incision site. That blew my mind because I had only known about spinal anesthesia and peripheral nerve blocks, so it was so cool to see that there are many different types of pain relief available. Unfortunately, I did have to step out of the OR for a few minutes. The smells were starting to bother me and I also wasn’t used to breathing with a mask on. Everyone was really kind and made sure I was okay. I was able to walk around for a few minutes and got some crackers and water. I didn’t feel like I was going to pass out, but I felt like I needed some fresh air for a few minutes. I was a little embarassed because I didn’t think anything would get to me, but you don’t know until you’re in the OR. Several people in the room made me feel better once I returned by pointing out that everyone has to get accustomed to watching surgeries, so it’s completely normal that I didn’t feel great for a bit. Here’s an animated video of a knee replacement. Skip to 4 minutes to see what happens during surgery. And here’s a video of an actual surgery. Again, there are a lot of other videos on Youtube so definitely watch other videos if you’re interested! I thought this commentary was easy to follow, so I chose this video. Have you seen any surgeries during your clinicals? Share your story below!